Graduate research assistants worked on “cleaning” the data through consistency checking, creating variable descriptions, and constructing the 1880 codebook. Dan Kallgren recalled, “We’d take those data sets, run them through Todd’s consistency checking programs, and if there were errors, it got flagged … and we’d have to go back to the microfilm to see if it was an entry error, or no, it actually was that way. I remember doing that a lot. It seemed like for years!” The labor-intensive nature of the work in the small office workspace on the sixth floor of the Social Science Tower of the University of Minnesota fostered an esprit de corps among the graduate research assistants (see displayed photo and t-shirt). An early plan for disseminating the 1880 PUMS results was to publish a book, America at 1880: A View from the Census. Only two known hard copies of the book manuscript are extant (see display). While the manuscript was never published, the ten essays produced for the volume were presented at conferences and a few were published as journal articles. Before widespread access to the Web became commonplace, the 1880 PUMS data were released via 9 track tape. 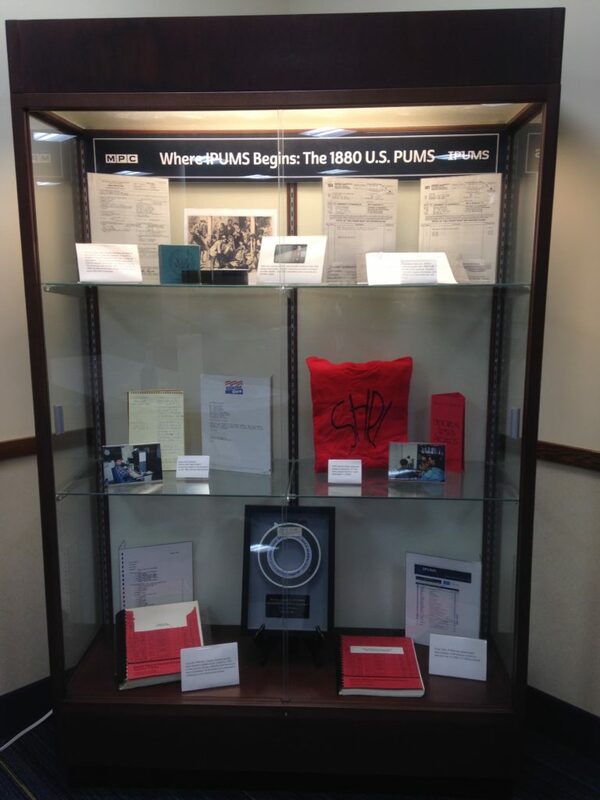 An early release of the 1-in-100 subsample data was presented with aplomb at the October 1990 Social Science History Association meeting in Minneapolis (see display). Fans went wild for the 1880 PUMS. Since 1999, IPUMS has disseminated approximately 8,499 extracts containing data from the 1% 1880 U.S. census sample. Do you have an item from Minnesota Population Center history that belongs in the MPC archives? Contact Diana Magnuson at magnu435@umn.edu. Please stop by the display if you are in the area, it will be on exhibit through summer 2017.